This geo park is in eastern Kochi prefecture, around Muroto city, and faces the Pacific Ocean. It is recognized as a UNESCO World Geopark since you can find history of diastrophism. Geopark is a word combined “geo” and “park” and it means a place where you can learn about the Earth and enjoy altogether. There are 127 locations in 37 different countries around the globe that are recognized as geoparks and eight of them are in Japan. Muroto was put on the list in September 18, 2011 (according to Japan Geopark Network homepage). Muroto experienced a two-meter elevation gain in last 1,000 years and the history of the land or many geological events can be seen. These features make Muroto a very unique place on Earth. For instance, “Mikurodo” and “Shinmeikutsu” are caves formed by sea waves around 1,200 years ago and Koubou Daishi stayed to attain spiritual enlightenment. In his time, the caves were much lower than they are now and you only could see sky and ocean from inside. You can see underwater stratum formed around 30-40 million years ago in Gyoudo-Kuromi beach, another site of dynamic events of the Earth. 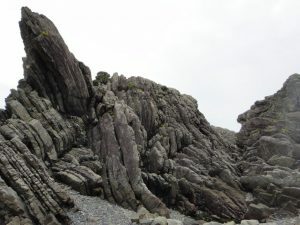 You can find turbidite structure, piled up layers of sand and mud, in vertical direction, slumping structure, a disordered structure of stratum caused by landslide at seafloor, ripple marks caused by water flow, trace fossil which shows biological activities, a dike of sand stone formed by liquefaction after an earthquake thanks to huge elevation of land there. Marine terrace and shallow of west side water make a great place for fishing and agriculture and have formed local lifestyle and culture. In contrast, the east side is a steep fault scarp and it forms unique industries like collecting deep sea water. Muroto Geopark is where you can meet unique geology and climate, and life and industry which take advantage of them. The park’s guides explain well about these things. This place changes one’s way of thinking of scenery and landscape and makes one think that you want to go again. Most of most of flammable waste from households are burned in Japan, but not so anymore in Mitoyo, Kagawa prefecture. 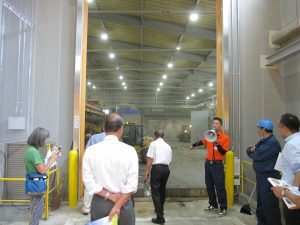 The Biomass Recycle Center Mitoyo is located in Mitoyo city and is the first and only facility to process garbage without burning. We visited there to see and learn about the facility which started operating in April of 2017. The waste disposal facility is hardly noticeable because there is no smell or smoke, which is common for such a facility. They use a technology called “tunnel compost.” They collect flammable waste from households in Mitoyo and dispose of it with a fermenter called “bio tunnel” and a deodorizing unit called “bio filter.” There is no burning in this process so not only does it not generate any carbon dioxide but also produces no incineration ash. 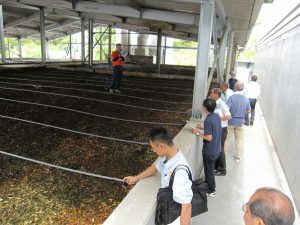 The heat generated in the fermentation part is used to dry the waste. Surprisingly, this dried waste can be used as solid fuel. Another surprise was innovation devised for the separation of waste. Separation used to require a lot of manpower, but a labor-saving system and the process of cutback which is required during fermentation in ordinal facility is unnecessary due to detectors and an advanced fermentation control system. Thanks to that, there is a very small number of people needed to run the facility. In addition, there are many other ideas and know-how to adopt European technologies here and I was happy to hear such stories. Reservation to tour the facility are required. If you are interested, check out the web page of Eco Master. There is a “kingdom” in Seiyo city that everyone loves. Donguri Oukoku (Acorn Kingdom) is a NPO which is helping students who refuse to attend school or stay shut indoors at home. It also helps the parents of such students. The goal is to get the student to return to school and to rejoin society, and support child care generally. The organization is located in Uwa in Seiyo city where you can find Kannonsui, one of the Selection of 100 Japan Water. At Donguri Oukoku, one can experience agriculture and can touch cows, horses, chickens, dogs, and goats. The rich nature and the animals have been healing many children. 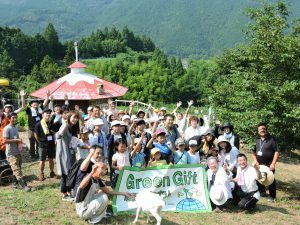 The organization has been working on a new project funded by “Green Gift Earth Genki Program”. Tokio Maritime Nichido Fire Insurance runs this program with funds they raised by reducing paper costs by choosing to show contract agreements on the Internet instead of on paper. The project is now being done with 21 groups around Japan. Donguri Oukoku is one of the operators of the program in Ehime and holding events twice a year with the keyword of three different meaning of Japanese “Shoku”, touch, grow, and taste. A second event was held August 20 and an overflow audience of 39 people gathered. For the first and second shoku – touch and grow – they set a theme of touching nature through observing the biotope and touring the headwaters so participants can see the condition of the pool, the creatures living there and the growth of plants that they planted in the first event held in May. It was impressive that lecturer deepened his lecture by communicating with children. For the third shoku – taste – was one that all staff and participants were looking forward to. It was a very original event that only the “kingdom” (that farm) can do because of its recycle-based organic agriculture using compost from cows, horses and chickens. With the help of ladies in the child care support division, we had an awesome lunch like barley rice using barley produced on the kingdom, Satsuma soup, fresh eggs and vegetables. There are many repeaters of the event and even some families have been taking part in it since the very first event. This is the hub of a people’s network and a place to learn from each other. With such a task, it is worth to keep an eye on the kingdom to see what kind of gift they will bring to kids for the future. Copyright © 環境省 四国環境パートナーシップオフィス All Rights Reserved.